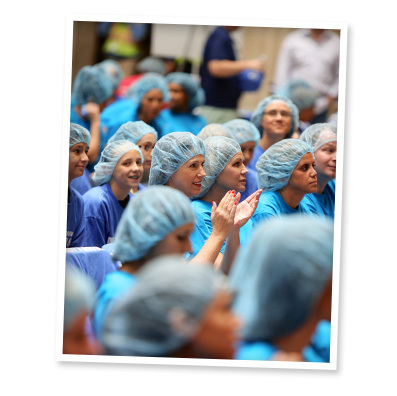 Thank you for considering volunteering with FMSC! Below we’ve listed a couple important details that are good to know when preparing to pack meals at any Feed My Starving Children site or MobilePack event. *We recommend that groups of youth be third grade or older. To comply with FDA requirements and remove all opportunity for foreign objects to fall into our life-saving meals (which could cause choking, tooth breakage and more), FMSC volunteers must remove all jewelry and/or accessories before packing. Will there be a safe place for me to put my jewelry at FMSC? There are a limited number of lockers available for use at our permanent packing sites, with a personal pin code locking system. FMSC is not responsible for the safekeeping of any volunteer’s jewelry, so if you are concerned, it is best to leave it at home. Can I put my jewelry in my pocket? No, please do not place loose jewelry into your pockets. However, FMSC will provide a plastic, zipped bag for your jewelry, which you can then place into your pocket. I’ve volunteered at FMSC in the past and was allowed to wear jewelry, why can’t I do that anymore? In order to comply with FDA standards for food manufacturing plants, FMSC was required to change the jewelry policy. The quality of our food is very important to us—this updated policy will help to insure that foreign objects will not contaminate our food. If my earrings will be covered by the hairnet FMSC makes me wear, can I leave them in? No, you still must remove your earrings.